Back in March I spent two weeks exploring the Hawaiin Islands of Maui and Kauai. Typically I like to get a collection of “best-ofs” together as quickly as possible, but I’ve been savoring a lot of these locations, slowly making my edits and I’m still sitting on several of my favorites. Below is a list of all the gear I brought with me (including links to where you can find it), and every piece of equipment was used. I’ll be honest. I didn’t shoot much in Maui. I stayed in Kaanapali and spent the majority of my time laying on the beach. Kauai was the real photo destination for me so a little relaxation and way too much sun for this pale guy were in order. However I was lucky enough to get a couple catamaran rides on the Teralani as we were in prime season for scoping the migrating humpback whales. 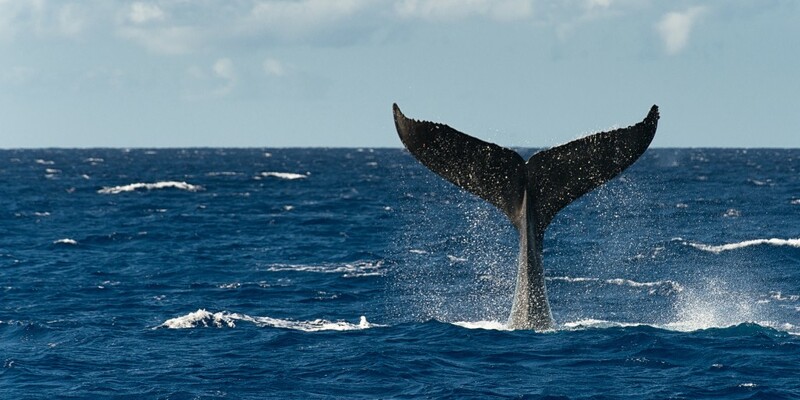 This was my first time attempting to photograph whales, and get this: it’s not easy!!! I have such a profound respect for wildlife shooters—the patience and commitment it takes to capture that perfect moment is tough to describe. Sure, landscape work relies on only a couple minutes of good light, but you at least have those couple minutes. Trying to get a sharp image of a whale that may or may not ever surface, while trying to keep balance on choppy water, while doing your best to forget you already have the weakest stomach on the planet as you stare through a viewfinder…well…it’s not like relaxing in the sand waiting for a long exposure to finish! I had to get the classic tail shot. The humpback breach that made the whole trip come together is coming up soon. Maui, you charged my batteries. Time to get to work. I’m a shoe-in for the relaxer hall-of-fame but on photo trips I don’t sleep. I’m on a mission and want to make the most of every second. Luckily between the time difference and constant rooster crows on Kauai sleep wasn’t much of an option, anyway. I rented a little place at the top of Princeville Bluff, overlooking Hanalei Bay, but in hindsight that wasn’t necessary. I could’ve easily gotten by camping and hitchhiking everywhere. 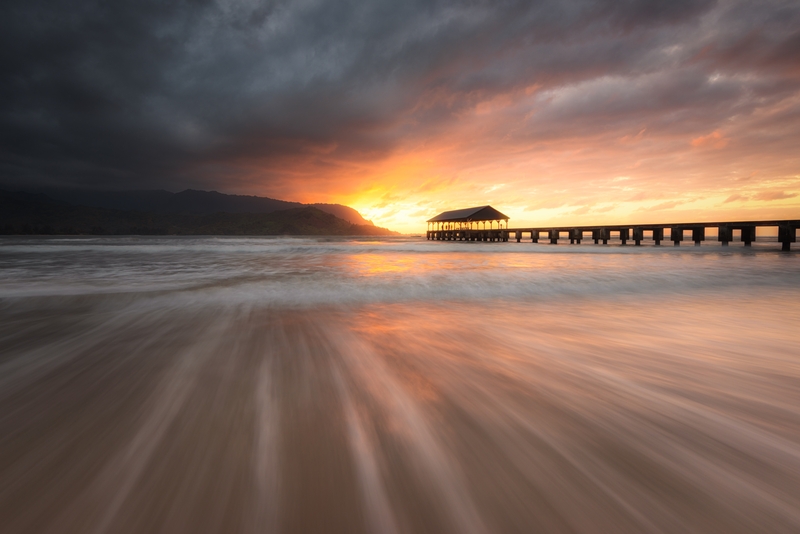 My first night in Hanalei was met with a fiery sunset that just didn’t want to stop, so I had to pay tribute by documenting the whole thing with my Nikon D800, D7000 and Df I rented from BorrowLenses (the Df is underrated—I love that camera). This first image was shot with the D800 on top my TVC-33 tripod and BH-55 LR ballhead. Firing slow shutter speeds (with a LEE 0.75 Soft Grad ND and Singh-Ray 0.9 Soft Reverse Grad ND) ranging from 1/15 to 3 seconds I was able to get the tide pullbacks exactly how I wanted. Is the TVC-33 a bit of overkill for the D800 and 24-70mm/f2.8? I guess you could say that, but running back and forth to the top of the famous pier I knew I’d be able to trust the sturdy tripod to keep my gear safe. I’ll always carry a bit more weight for optimal support. As the D800 was hard at work firing slow shutters I put the Df to the test, pushing exposure times into the several-minute realm. The symmetrical shot below was a must and I set the Df on the TQC-14 tripod with BH-30 LR ballhead down at a low angle to avoid taking up too much space on the pier while still having the leading lines right at my bottom corners. Once again the TQC-14 was the perfect travel companion, fitting in every carry-on along the way, even supporting the D800 with 70-200mm/f2.8 for long exposures. Folks continued walking by, but my Formatt Hitech 10 Stop ND filter helped in blurring most of them out of frame. I also used my LEE 0.9 Soft Grad ND to retain detail in the vibrant sky. It may seem like it was an eternity ago but I used to be obsessed with rock climbing, and ironically enough, had an unbelievably irrational fear of heights. Short of jumping out of a plane getting in a doors-off helicopter seemed to be the cure, and I liked it so much I immediately booked a second flight for the following day (and am now so obsessed I’ve done two flights over San Francisco and am scheming on a Chicago tour in 2015). If you’re ever in Kauai do yourself a favor and book a helicopter trip through Jack Harter Helicopters, and make sure you do it with the doors removed. What did I bring and what shouldn’t I have brought? The first flight I thought I had all bases covered—the D800 had the 16-35mm/f4, Df had the 24-70mm/f2.8 and the D7000 had the 70-200mm/f2.8. Yes. Three relatively heavy cameras—can you guess which one I didn’t use even once? Even though the two images below were shot with the 16-35mm/f4, the vast majority were taken with the 24-70mm/f2.8, and for the second flight I swapped so the 24-70 was on the D800 (no changing lenses during the flights). 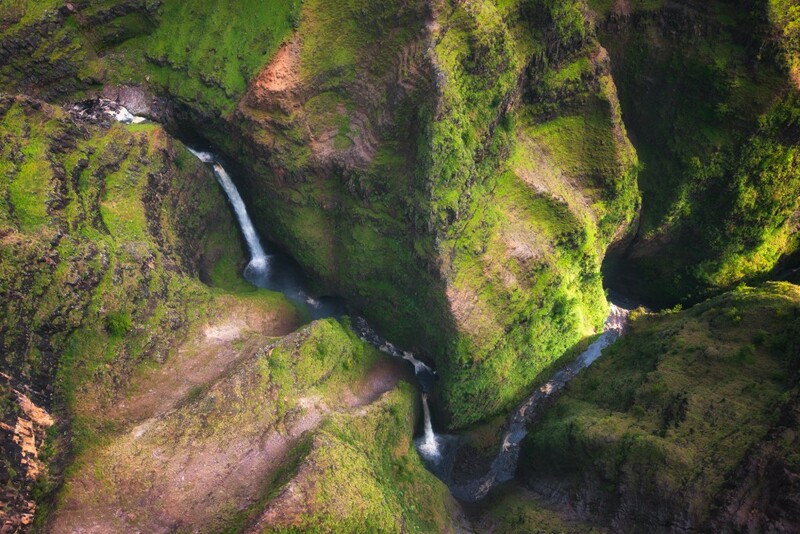 The super-wide lens was perfect for getting the sweeping panoramic view right when flying over the last cliff and entering spectacular Na Pali Coast, and also for the vertigo shots where I could shoot nearly straight down while the helicopter made a hard turn, but other than that it was really just a pain as the helicopter blades were constantly in frame. I could have easily used the 24-70 and D800 exclusively. The 70-200 could be great for tight crops on waterfalls, but my personal taste for slow shutter with water didn’t have me incredibly excited about those frames. It should go without saying a polarizer is your friend for making the rainbows pop (and I use a couple b+w circular polarizers). Oh yes. The odds of NOT seeing a rainbow on the rainiest place on earth are less than slim. My next post will be all about aerial photography so it will be much more in depth than this regarding tips and tricks. One last point about gear: I loathe camera straps. I’m not dexterous enough to NOT strip my camera’s socket by using those popular shoulder straps, either. Thankfully Really Right Stuff has the B2-FABN mini-clamp which can attach directly to a ¼-20” stud on shoulder straps such as the BlackRapid, and also has 3 strap bosses to be used with neck straps, additional safety loops or in my case: multiple neck straps and webbing from my backpack. The B2-FABN will accept any Arca-Swiss compatible camera body or lens plate. Being the type of shooter that goes from handheld to tripod mounted quite erratically quick releasing straps off my cameras is crucial for me. My gear was NOT falling out of a helicopter and I used the same precautions on the boat trips. Below are two of my favorite images from the Jack Harter Helicopter Tours. Ke’e Beach. A scene from a fairytale. The gateway to Na Pali Coast and the rigorous Kalalau Trail (No, I didn’t do the trail as this trip was all solo—next time for sure but it didn’t seem smart going out there alone). 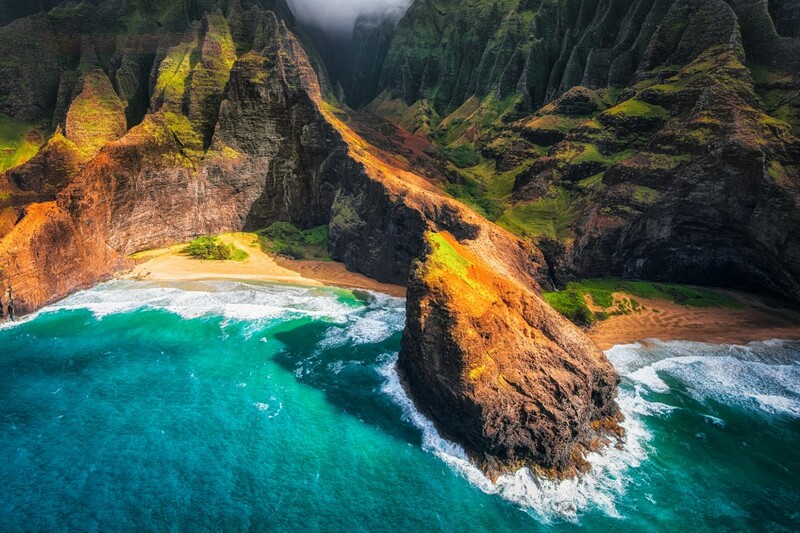 Ke’e Beach is home to the famous fan waves, which at times curl up like dragon tails. I caught several, but continue to sit on those images. 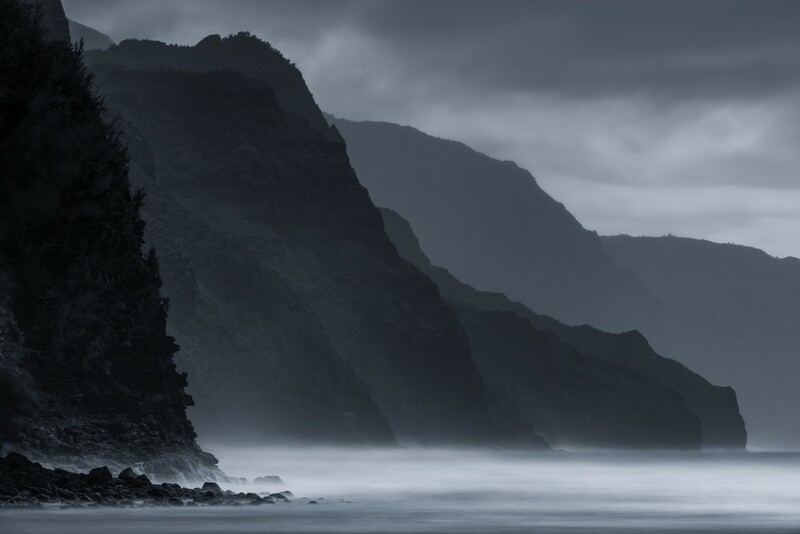 The beauty of the 10-stop demonstrated here: during my entire week on Kauai there was a very high surf advisory, and the waves were crushing in this scene, but the 30 second exposure did its best to hide all the chaos. For this image I used my D800 on the TVC-33 tripod and BH-55 LR ballhead. On top of the b+w 10 stop I used the LEE 0.75 Soft Grad ND turned upside down so the dark edge was at the bottom of the frame. I then stacked the LEE 0.9 Soft Grad ND with the dark edge closer to the top, creating a bit of neutral density gap to really exaggerate the white wash from the ghosted waves. This is a technique I use quite often for seascapes, especially for mid-day black and whites. Awkward situations always make me laugh, and it goes without saying this sleep-deprived, hadn’t-trimmed-the-beard-in-way-too-long guy with several cameras got some looks from all the nicely dressed couples. I naturally got a chuckle out of the funny looks as they were to be expected, but in all seriousness, those guys at Captain Andy’s were very cool, and they fed us well. If you’re looking for a great meal with arguably the best coastal view on the planet, Captain Andy’s has you covered. And even better: I was the ONLY photographer on a boat of a few dozen sightseers. Had I been on Kauai during peak season I’d have certainly gotten on a much smaller, dingy boat for an entire day, but that wasn’t possible this trip. 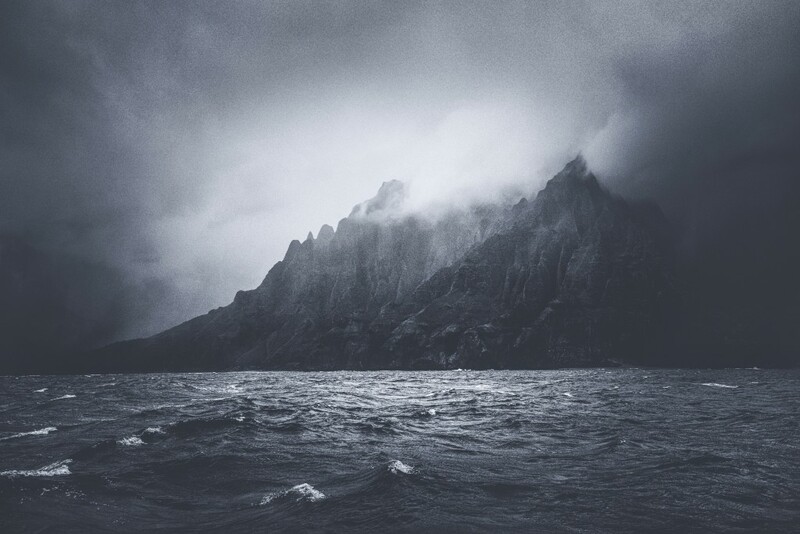 We sped over the choppy Pacific, racing to hit Na Pali before sunset. We were met with lots of rain, as you can see in the first image, which I edited with several VSCO filters to create this old, moody feel. Traveling from drought-ridden Central Coast California it goes without saying I embraced the wet climate and dramatic skies. And then THIS happened. As we began heading back to port from Na Pali a rainbow appeared right at sunset. Frame after frame with the Nikon Df and 70-200mm/f2.8, and out of nowhere a mother humpback whale breached right by the pot of gold. “Not safe for work” is how I’d describe my loud reaction. 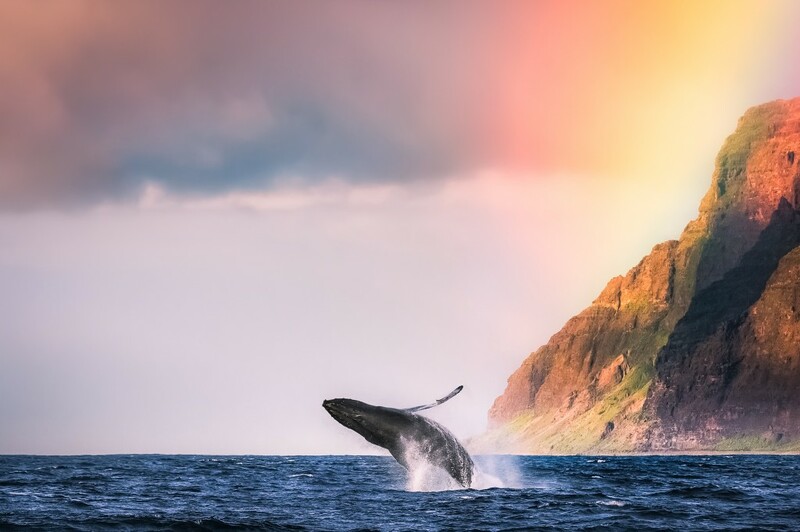 I will never, ever, ever forget watching a mother humpback and calf breaching over and over under a sunset rainbow on rugged Na Pali Coast. We talked about that high surf, right? 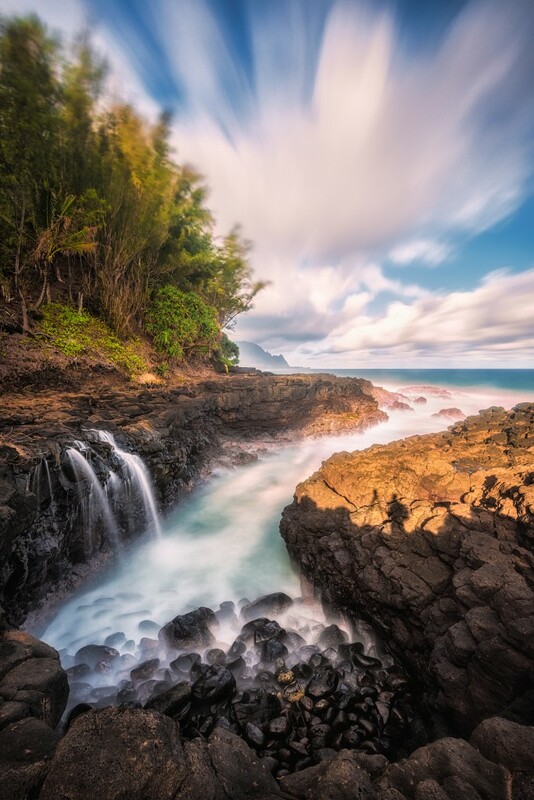 Below is Queen’s Bath in Princeville, just after sunrise. 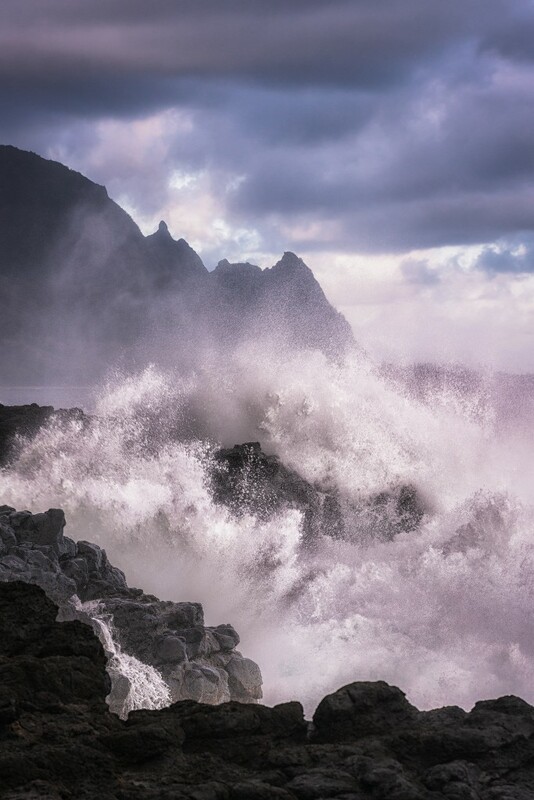 This was my last morning on Kauai, and due to the dangerous waves I couldn’t set up my tripod where I’d have liked, so handheld a ton of frames with the D800 and 70-200mm/f2.8, freezing the ocean’s drama. One more photo, and even after months have passed this is still bittersweet. As you can see in the image above the waves were huge and the wind was whipping. What you see below is a single D800 exposure (mounted on TVC-33 tripod and BH-55 LR ballhead) with my b+w 10 Stop ND and LEE 0.75 Soft Grad ND filters. If you look closely at the right side of this image below you can see my shadow, waiting out another long exposure, and waiting out the last photo I took during my trip. 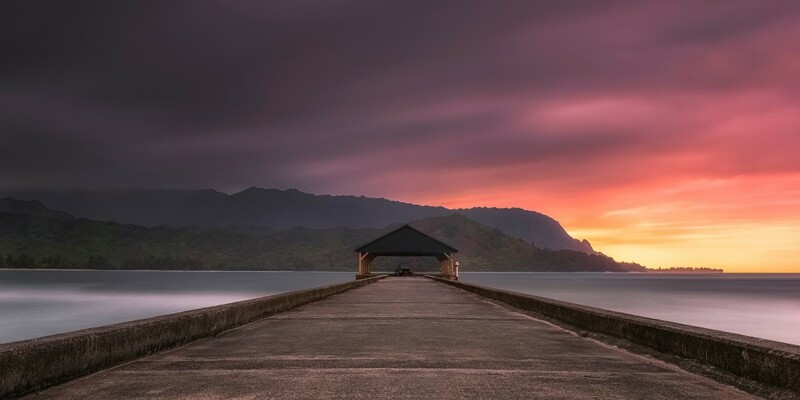 Kauai was special for so many reasons. The gorgeous landscape, the fact it was a vacation… I may sound crazy but doing the trip solo is what did it for me. Having travel companions is awesome, but being on no one’s schedule but your own, having to step out of your comfort zone a bit just to have conversations… that’s what I love about traveling and exploring alone. Having over a week to do my own thing, to reflect like crazy and focus on capturing more images than I’ll ever know what to do with in one of the most spectacular places on the planet… that’s what made the trip. To me the beauty of long exposure work is the time involved waiting for the image to finish, and during that time you can sit back and take in a landscape, only occasionally being interrupted to press a shutter every few minutes. This busy scene demonstrates exactly what I remember from the last morning in Kauai: standing still, taking in as much of the beauty as possible and never wanting the experience to end. Thanks for taking the time to read this account of my first trip to Hawaii, and if you have any questions about the trip, from gear to food to locations, please don’t hesitate to ask. Great stuff Mark, those aerial shots are unreal. Well done mate. Cheers, Ben! Thanks for taking a look, and keep up the great work. I’ve been a huge fan of yours for some time. Mark, unbelievable photography and account of your trip to paradise. I am planning a trip to the islands in 2015 and will certainly use your article as my guide for where to go, what to see and what equipment to use. If you ever decide to guide a tour anywhere in the world, please let me know. I want to be the first to register. Thank you so much for the kind words, Jack. Please let me know if you have any questions or would like any recommendations before your trip–happy to help! Take care. That is a great idea of using opposing ND grads. Will have to check that out. Your images are exceptional and inspiring. I guess I have to get out of the studio more. That is, after all, what I came to photography for in the first place.